Aloha everyone! The month of May is almost upon us and I have so much to do. 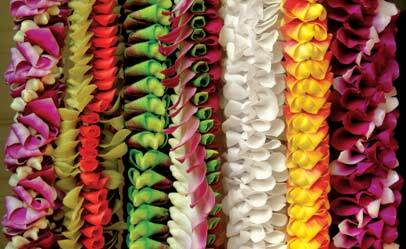 Many of you may be getting ready for a little Cinco de Mayo festival, but in Hawaii May 1st is Lei Day. Each year on May 1st Lei Day is celebrated throughout the islands. Leis are made from so many of the gorgeous flowers on the island and there are dozens of lei making competitions. Leis are given for all occasions, May Day, birthdays, Mother's Day, graduation, new jobs and of course as a welcome to the island. Our own Hawaiian studies teacher has asked that students bring in a lei to wear on May 1st. Well I know that there will be some that bring them in, but also quite a few who will not have anything to wear. So I thought I would make some leis with my students this week to celebrate. To make leis you will need 16 paper flowers per student. Beads with a larger opening like the blue and purple. Don't forget to hole punch the flowers. to fit through the beads. I had them sit on the floor in groups of five around the room. It was a perfect way to have them work together and share materials without spilling all over the desks. They wanted to take them home so badly, but we are keeping them at school until Wednesday. If you have older students there is another lei that you can make that is a bit harder. You will need around 16-20 depending on how long you would like your lei. Each flower begins with a loop. You will make four equal loops and twist to keep them in place. 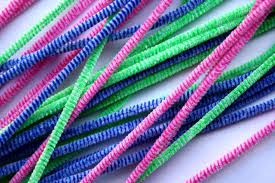 I use one pipe cleaner for the final connection and only loop the ends. It is much more comfortable to wear. I filmed my students singing May Day Is Lei Day, but I left my iPad at school! Bummer :( But I did a google search and I found this video, which is great until the same guy gets up and walks across the video several times. It reminds me of Mystery Science Theatre, lol! Enjoy! What a gorgeous blog post. The photos are amazing and your students are very lucky to be able to experience these traditions in your culture. I love this. We're testing this week and making a lei would be a perfect activity. When we went to Hawaii I couldn't wait to get a lei. I know isn't it funny, but that was the first thing that I wanted when I got to Hawaii. I still get excited when I receive a lei! That's for sharing these ideas. They look beautiful! These are wonderful! When my kids were little, we did an entire preschool unit on Hawaii. I wish I had these ideas when I taught them! I bet that they would still love to make them! I just love this post! I am learning so much about Hawaii from you! Last summer we bought plumeria cuttings and they are starting to bloom now. They are SO beautiful and they make me think of Hawaiian leis! Thanks for sharing! Gina once your plumeria bloom you can make a plumeria lei very easily! What fun ideas!! I love the paper leis for kids who don't have one for the celebration. We are really lucky and our Hawaiian studies teacher is making real plumeria leis with my class! I can't wait to make my own! What great ideas, especially for those who can't bring one. The leis are very beautiful! I love this idea. We are having a Luau for our 4th Quarter Behavior Party and we were going to just give the students a lei. I love the idea of having them make their own. I am so glad I stopped by. It has been a while since I've blog hopped. Busy! Busy! Busy! Can't wait to share this with my teammates.